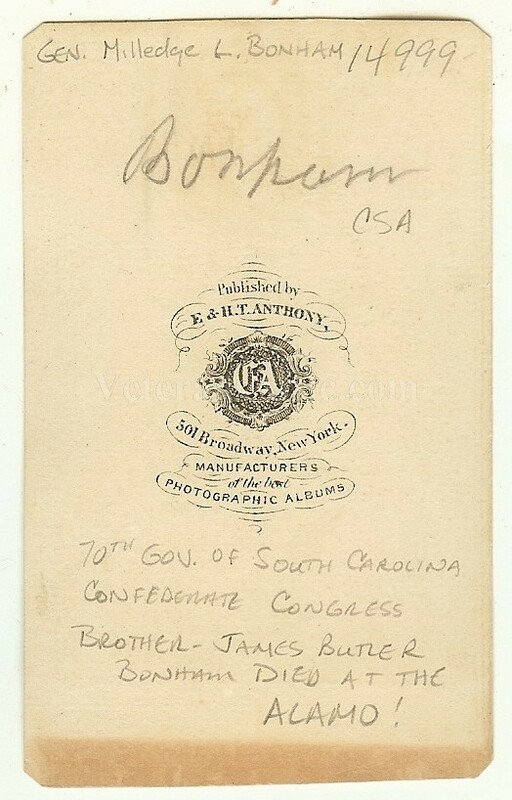 Offered is a nice CDV of General Milledge L. Bonham, Confederate general and 70th Governor of South Carolina. The image is nice. The carte has clipped corners and the backmark is E.&H.T. Anthony, New York. Milledge Luke Bonham (December 25, 1813 – August 27, 1890) was an American politician and Congressman who served as the 70th Governor of South Carolina from 1862 until 1864. He was a Confederate General during the American Civil War. Milledge L. Bonham was born near Redbank (now Saluda), South Carolina, the son of Virginia native Capt. James Bonham and Sophie Smith Bonham, the niece of Capt. James Butler, who was the head of an illustrious South Carolina family. Milledge was a 1st cousin once removed to Andrew Pickens Butler. He attended private schools in the Edgefield District and at Abbeville. He graduated with honors from South Carolina College at Columbia in 1834. He served as Captain and adjutant general of the South Carolina Brigade in the Seminole War in Florida in 1836. That same year, his older brother James Butler Bonham perished at the Battle of the Alamo. Bonham studied law and was admitted to the bar, in 1837, and commenced practice in Edgefield. 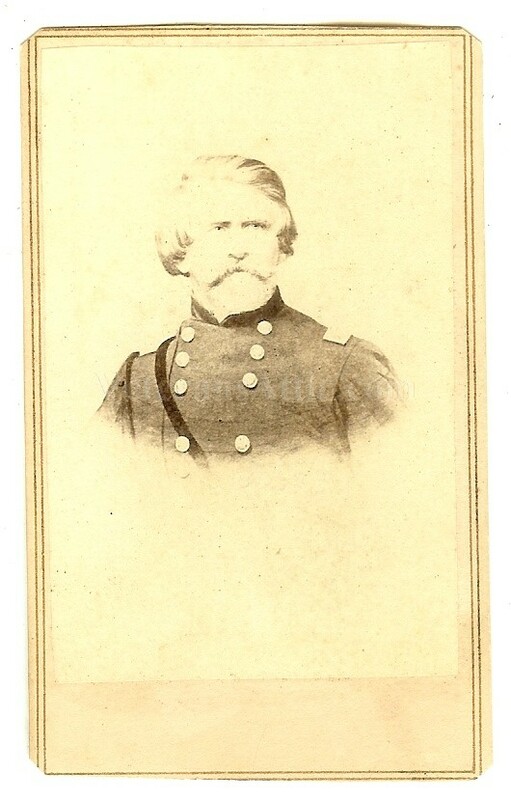 During the Mexican-American War, he was lieutenant colonel (from March 1847) and colonel (from August 1847) of the 12th US Infantry Regiment. Two other members of his regiment, Major Maxcy Gregg and Captain Abner Monroe Perrin, would also become generals in the Civil War. After he returned home, Bonham was the major general of the South Carolina Militia. Entering politics, he served in the state house of representatives from 1840–1843. He married Ann Patience Griffin on November 13, 1845. Bonham was solicitor of the southern circuit of South Carolina from 1848–1857. He was elected as a Democrat to the Thirty-fifth United States Congress (succeeding his cousin, Preston Smith Brooks) and the Thirty-sixth United States Congress, and served from March 4, 1857, until his retirement on December 21, 1860. In early 1861, the Southern states that had seceded from the Union appointed special commissioners to travel to those other slaveholding Southern states that had yet to secede. Bonham served as the Commissioner from South Carolina to the Mississippi Secession Convention, and helped to persuade its members that they should also secede from the Union. Bonham was appointed major general and commander of the Army of South Carolina by Gov. Francis W. Pickens in February 1861. He was appointed brigadier general in the Confederate Army on April 19, 1861, and commanded the First Brigade of the Confederate "Army of the Potomac" under P.G.T. Beauregard. He fought in the First Battle of Manassas, commanding his brigade as well as two artillery batteries and six companies of cavalry in the defense of Mitchell's Ford on Bull Run. He resigned his commission January 27, 1862, to enter the Confederate Congress. On December 17, 1862, the South Carolina General Assembly elected Bonham as governor by secret ballot. He served until December 1864. During his term, the General Assembly enacted a prohibition against distilling in 1863 and also that year, it demanded that more land be used to grow food instead of cotton to increase the supply of food in the state. Bonham rejoined the Confederate Army as brigadier general of cavalry in February 1865, and was actively engaged in recruiting when the war ended. Near Greenville, South Carolina a group of troops positioned there, because of worry of federal invasion from North Carolina, named their emplacement, Camp Bonham, in his honor.